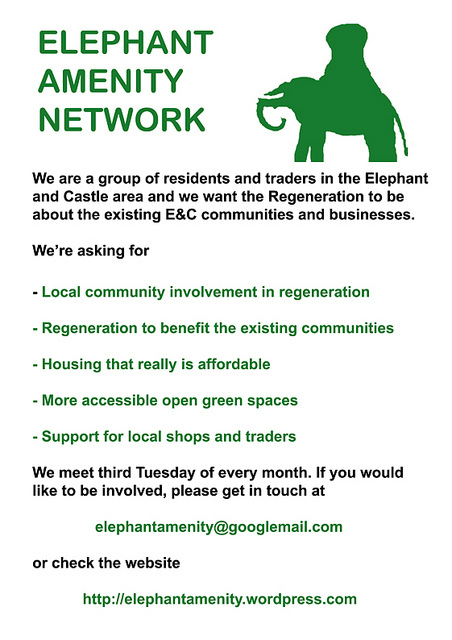 Members of the Elephant Amenity Network have published an open letter to the Chair of the Elephant & Castle Community Forum. The letter (downloadable here), contains a detailed appraisal and critique of the E&C regeneration plans and consultation process to date. This entry was posted in Events and tagged E&C, elephant amenity network, elephant and castle, elephant and castle community forum, regeneration plans by adosini. Bookmark the permalink.